Peplum waist with ribbon ties. Black Halo "Brooklyn" jumpsuit in double-faced viscose blend. Jewel neckline. Three-quarter bell sleeves. Fitted through the seat. Legs fall straight from hips. Concealed back zip. Nylon/viscose/spandex. Lining, nylon/spandex. Dry clean. Imported. Model's measurements: Height 5'10"/177cm, bust 31"/79cm, waist 24"/61cm, hips 34"/86cm, dress size US 2. 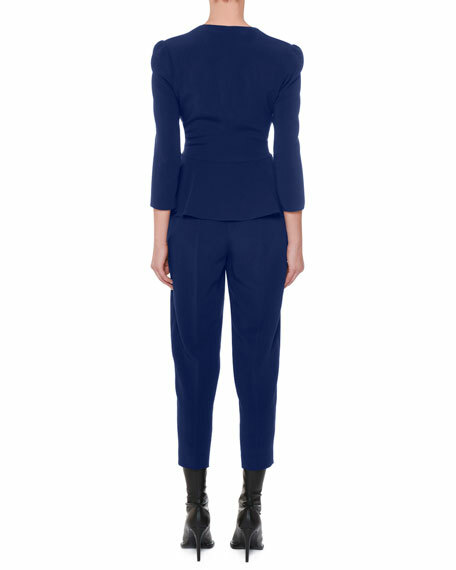 Black Halo "Jackie" jumpsuit in stretch-gabardine. Draped neckline. Cap sleeves. Belted waist. Side slip pockets. Slim fit bodice. Relaxed through wide legs. Hidden back zip. Nylon/viscose/spandex. Dry clean. Made in USA of imported materials. Model's measurements: Height 5'11"/180cm, bust 31"/79cm, waist 23"/58cm, hips 34.5"/87cm, dress size US 0/2. Black Halo jumpsuit with allover sequins. Deep V neckline. Short sleeves. Semi-fit bodice. Hidden back zip. Relaxed, wide legs. Cropped length. Dry clean. Nylon self. Nylon/spandex lining. Made in USA of imported material. Model's measurements: Height 5'11"/180cm, bust 32"/81cm, waist 25"/64cm, hips 35.5"/90cm, dress size US 0/2. Brunello Cucinelli jumpsuit in liquid velvet. Crew neckline. Short sleeves. Tie-waist detail. Side slip pockets; back besom pockets. Relaxed fit. 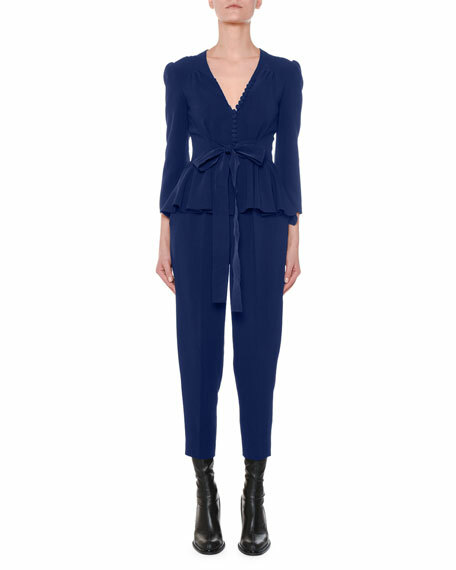 Brunello Cucinelli jumpsuit in liquid velvet. Crew neckline. Short sleeves. Tie-waist detail. Side slip pockets; back besom pockets. Relaxed fit. Hidden back zip. Step-in style. Viscose/silk/spandex. Made in Italy. Model's measurements: Height 5'10"/177cm, bust 32"/81cm, waist 24"/61cm, hips 35"88cm, dress size US 2/4.